The Hawks began their Yates Cup title defense with an emphatic win over the University of Toronto in their opening game. Led by defensive lineman Rashari Henry, the Hawks proved their defensive prowess throughout the game as they managed to shut out the Toronto offense, winning by a final score of 39-0. Henry was a standout for the Hawks, as the Ottawa native racked up a sack, tackle for loss, as well as a pass break-up on a deep pass, all in the first quarter. “I thought our defense was outstanding. They played very well, obviously shut out Toronto’s offense. Offensively there’s a lot for us to cleanup, but I’m happy with the win,” head coach, Michael Faulds said after the game. On offense, the Hawks managed to keep a very balanced attack and their patient approach paid dividends as the game progressed into the second half. Although the passing attack looked inconsistent at times, especially during the first half, quarterback Michael Knevel was able to find his rhythm in the third quarter. “You could kind of tell it looked like the first week. As the game went along you could tell both our passing and rushing attack was definitely better in the second half,” Faulds said. The run game gained momentum in the second half as the Hawks built a sizeable advantage. The Hawks tried to test the Varsity Blues secondary a number of times in the second half by throwing it deep downfield and although they were unsuccessful, this opened up the underneath routes. A particular highlight was his connection with receiver Carson Ouellette in the second half, as they linked up for a 52-yard touchdown, increasing Laurier’s lead to 25-0. Both ‘thunder and lightning’, as described by coach Faulds were able to knife through the Toronto defense and gained some important first downs. The Hawks’ special team’s unit was very impressive as well. Laurier was a consistent threat on kick returns and the offense was constantly set up in favorable field position. Next up for the Hawks is a much needed bye week early in the season as this game had no shortage of injuries. 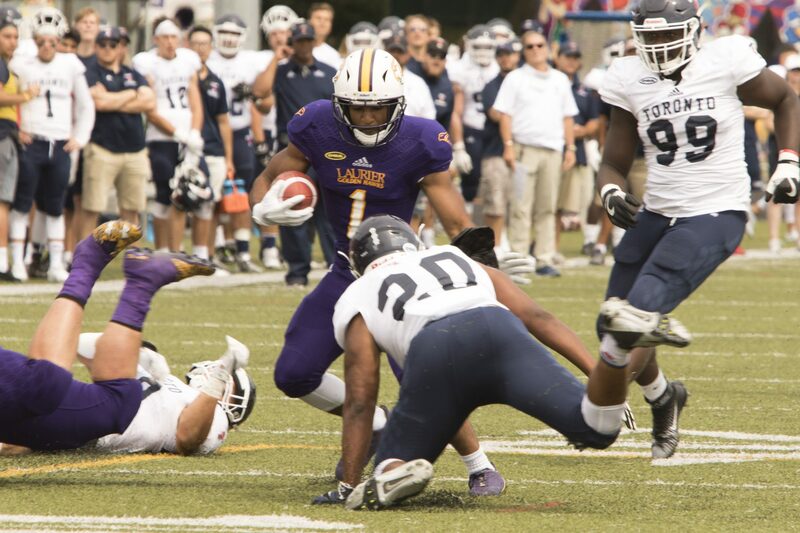 After the bye, Laurier gets Carleton, a team that gave them a lot of trouble last year. The two teams dueled it out in a nail-biter last fall, as the Hawks were able to escape with a 17-16 victory. Faulds was quick to mention what the Hawks needed to improve on over the next couple of weeks. “Offensive execution; we’ve got to get a lot better. We got to clean that up, but we have to improve in all phases. As a coach you look more at the negatives than the positives,” Faulds said. It won’t be easy for the Hawks to go 2-0, but with a fast start in their opening game, the team seems to have picked up right where they left off last year. Author: Pranav DesaiPranav is an avid sports fan who also enjoys writing. Now in his second year as Sports Editor for The Cord, he is aiming to make the sports section better than ever. His ideal career would involve sports in some way, and he hopes that the Cord can help him reach that goal in the future.